Leeds United 1 Bolton Wanderers 0: Travels of a Leeds fan. The ongoing pantomime that is Leeds United played out another excruciating chapter this week in the full glare of the football world. Mr Cellino saw sense and admitted his appointment of an inexperienced, unknown and untried Head Coach at Championship level just wasn't going to work and dispatched Mr Hockaday to sleep with the fishes. This after giving him a stay of execution only three days before! It's got that bad now that even rival fans are feeling sorry for us! Our mad Italian owner is now searching for a replacement who can not only mould the 12 new arrivals at Elland Road into a decent team but cope with a trigger happy boss who has a penchant for micro management. Not for the first time in the last decade the loyal Leeds fanbase are left scratching their collective heads wondering which way the good ship SS Leeds United will lurch to next. In the meantime Neil Redfearn steps into the breach, as he's done before, to take charge for the relegation 6 pointer against Bolton Wanderers. How would the team react? Who's actually available for the match after all the sendings off and injuries? Will Beckford score a sneaky own goal? These questions and many more were debated as the Happy Chocker, Quiet One, Brother Chris and yours truly made our way to LS11 for another dose of Leeds United. Redfearn certainly didn't hold back when he announced the team. Mowatt, Cook, Sloth came into the side as Silvestri replaced Taylor in goals. Antenucci ousted Smith up front whilst Bellusci got the nod in front of Cooper. Wootton remained at right back with Benedicci, Dawson and Taylor all on the bench. Wow! With so many changes that had Redfearn's mark all over them the concept that Cellino was picking the team and tactics suddenly looked pie in the sky. We took our seats with an extra spring in our step hoping that Redfearn's mix of the foreign legion and the academy's finest would blend together seamlessly? The game kicked off in bright sunshine as Leeds immediately started the way they intended to go on with the ball zipping along the floor between Leeds players fuelled by a Lewis Cook inspired midfield. This was lots better. It was Bolton who had the first chances though as first Danns threatened before Spearing threaded a slide rule ball for Joe Mason to test Silvestri with a stinging shot the keeper thankfully turned onto the bar. The home fans in a crowd of just short of 22,000 liked what they saw and soon lifted the decibel level in the old stadium. Leeds were still playing a version of the ill fated diamond but now there was a structure to it and in Bianchi, Sloth, Cook and Mowatt we had 4 players who not only could pass the ball to each other but actually demanded the ball off their colleagues. Bliss! Sloth in particular had made a good start with his first touch a lovely flick and turn that left his marker for dead. "Steady on son you won't get very far at Leeds with those sort of tricks" an ironic punter shouted. On 15 minutes he further enhanced his standing by going past three defenders before shooting over the top, something fans are just not used to seeing. Things were looking good and they were about to get a whole lot better. A lovely flowing move from Leeds fired by the young guns Cook and Mowatt found Sharp on the edge of box. He rolled the ball out to the marauding Warnock who casually side footed the ball towards the 6 yard box for the on rushing Sharp and Antenucci but a slight deflection took the ball past Bogdan and into the corner of the net. Get innnnnnnnnnnn. 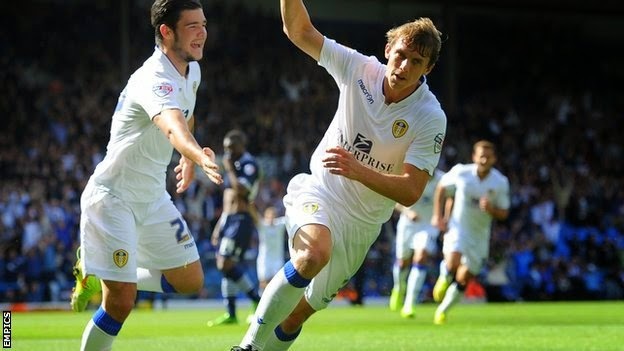 1.0 Leeds and all of a sudden the horrible start to the season began to fade in the memory. Leeds continued to spray the ball about with confidence driven by the axis of youth in the centre of midfield. Bolton did threaten to upset the party though with Davies, Danns and Mason all testing Silvestri in the home goal but all to no avail. At the other end Sharp and Antenucci were working hard against a tough Bolton defence. Sharp fired a shot just over as half time approached. The referee, who had a remarkable resemblance to Brian Glover's character in Kes, blew for half time with Leeds still leading by 1.0. Bellusci and Davies had an "in depth discussion" as they left the field before Andy Hughes broke them up. The urinal philosophers were understandably on fine form. "What a difference without Hockaday" one fan commented. "We're passing ball and to our own men! It's f****** fantastic" another beamed. "The young lads are brilliant" another shouted. For once there wasn't an ounce of negativity in the half time gents debate. Unbelievable Jeff! In truth Cook looked like the archetypal old head on very young shoulders as he strode about the park ably assisted by Mowatt, Sloth and Bianchi. The 2nd half got under way but now it was Bolton who were looking the more incisive team as Craig Davies headed a Mason cross wide with their first attack. Warnock's sterling efforts at left back came to an end after 55 minutes with an injury to his foot. Another of Redfearn's young guns, Charlie Taylor, replaced him. Leeds were now digging deep to defend their lead as Bolton tested Silvestri with a number of shots from outside the box and searching crosses into the box but the new Leeds keeper was as solid as a rock endearing himself to the home fans with numerous Ankergen type flops on the ball as he caught the ball. Although under pressure Leeds were a lot more measured when they were in possession than of late and Cook took advantage of another good move when he hit a vicious right foot from 25 yards that deflected away for a corner. Benedicic replaced Sloth on 77 minutes at the same time ex Leeds hero Beckford joined the fray for the visitors. As ever he got an enthusiastic reception from the home fans as memories of Jan 3rd flooded back into the minds of many. Benedicic's first touch was a shot on goal as he drove a free kick just wide of Bogdan's goal. Ten minutes to go now and Bolton piled on the pressure. Leeds were hanging on. Antenucci nearly killed the game when he found space on the corner of the box but his shot fizzed wide. It was all hands to the pumps at the back as Bolton surged forward for one last push. Spearing and Danns fired dangerous shots that sent the blood pressure of the desperate Leeds fans high before Silvestri pulled off an amazing double save from first Beckford and then Mason deep into injury time. Eventually Brian Glover blew his whistle to signal a precious 3 points for the mighty whites. The team got a thunderous well deserved reception at the end with a chorus of Marching on together to boot. The majority of the 22,000 fans in the ground had fallen back in love with football again. Lewis Cook was my man of the match for the way controlled the deep midfield area closely followed by Mowatt but there were encouraging performances all over the pitch from Sloth, Bellusci, Sharp, Antenucci and in particular Silvestri. Wootton took some stick but let's not forget right back is not his position and he is only filling in their until Byram or Beradi returns. Smiles were on the home fans faces as we streamed away from the ground something that has been missing from the matchday experience this season. Will Redfearn be given the job permanently? Will the young guns still be in the team when we go to Birmingham? Would Andy Hughes fit the bill as the new Leeds coach? Lots to ponder over the international break. Roll on Birmingham away. Bolton played 5 won 0. Typical Leeds fan ...... glass is always half-empty, isn't it? As the old adage proclaims a win is a win. I was at the game and thoroughly enjoyed it! Atmosphere was cracking and the winning goal made the day. Great to see the young talent on the park, felt very encouraged with their performance and Warnock did well before going off. last twenty minutes were a bit wobbly, but that just added to the sense of relief when the Ref, who was obviously enjoying himself and didn't want to stop, finally blew the bloody whistle!! It was clear watching folk leave the stadium that they felt good and for myself at any rate, the new season started yesterday! Love these reports (Travels of a Leeds fan) really sense the mood of the fans from the report, keep up the good work! Roll on the Birmingham report.